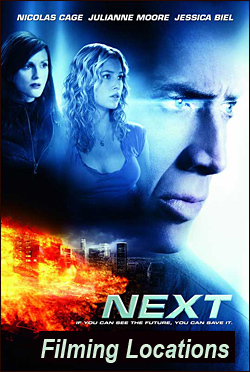 the 2007 Nicolas Cage movie "Next" was filmed. a terrorist organization planning a nuclear attack on the U.S.
locations wind up playing a key role. isn't really in Vegas at all. It's actually Pann's Restaurant, at 6710 La Tijera Blvd., in Los Angeles. about a mile and a half southwest of Fox Hills Mall and Holy Cross Cemetery. captured by the terrorists, tied to a wheelchair on a rooftop, and strapped with explosives. he and the government agents go to that rooftop and plot a rescue mission. 3rd Street (on the south), Broadway (on the west), and Spring Street (on the East). so that a sniper on a nearby roof can shoot & kill him. to the southeast of the Times rooftop. the bomb, defeat the terrorists, and free Jessica before the bomb goes off. boobytraps and assassins along the way. at Berth 240, near the southwestern part of Terminal Island, in the Los Angeles Harbor. The top (aerial) photo above is looking down south at the area, just above the Terminal Island prison. "Charlie's Angels: Full Throttle" and "Hollywood Homicide". American Marine (and its surrounding area to the east) is also seen in some scenes. American is located at 1500 Barracuda Street, on Terminal Island. The photos on this page are stills from the DVD of "Next"